Tell us a bit about the society’s journey in Delhi so far. In early 2011, one of my friends in Mumbai asked me to come and meet the people at Enlighten. They informed me about their plans to open a Delhi chapter. We began working on the Delhi thing in March 2011. I have a few contacts in the film societies across Delhi. I contacted embassies and cultural centres for support and affiliation. We started off with the Spirit of New York film festival at the American Center. Then we organized the Delhi International Film Festival in three colleges across Delhi—Kirori Mal, Miranda House and Indraprastha College for Women. 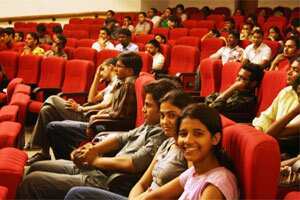 We also conducted a screening of heist films in Jawaharlal Nehru University. After that we decided to have weekly screenings at the Siri Fort Auditorium, which we had in November. But since we were looking for a more centralized location to show our films, we decided to pause for a month. We are looking for a location close to Connaught Place, and will begin screening films on a weekly basis in January. What kind of films are you planning to showcase before the Delhi audience? Do you have a city-based strategy? The idea of initiation should not have to do with the kind of films being shown but the atmosphere that’s created for them to be screened. What sort of an atmosphere are you hinting at? My idea about screening films is different from the parent body at Enlighten. I think the central idea of a film club is to hold it on an intimate level in a cozy space. You will engage better with the film and fellow cineastes. Otherwise you lose out on entrenching yourself within the film. All legendary societies across the world have operated out of small spaces carved out for a small bunch of people. We are collaborating with a travel café in Delhi to screen films on LCD. We will invite small groups of people to watch the films. Gauging the response we get, we will use it to create a strategy for the future. What kind of films did you show in November and what are your plans for January? We began with comedies since they tend to click with a larger number of people. We began with the Marx Brothers and Ernst Lubitsch. We then moved a grade higher to Jacques Tati’s Play Time, the response to which wasn’t very good. But as a film programmer you have to take the chance. We had planned to do a retrospective of Fatih Akin’s films in December. But since we discontinued the screenings, we will begin with the Akin retrospective in January. Membership to the Enlighten Film Society, Delhi, is open. Charges are ₹ 2,000 for a year’s membership that covers all the weekly screenings and the film festivals organized by the society, and ₹ 1,000 for a half-year membership. Students get a 50% discount. For registration and details, call Suraj at 7838340196.